CHESTER, W.Va. — When work began on a strange new reservoir in the hills outside this Ohio River town, local officials promoted the project as offering something for everyone: an aquatic playground for boaters and sunbathers, and for the local power plant, a dump. 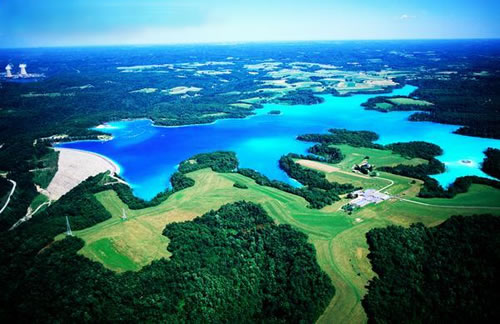 “Eventually, you may swim and fish in this waste-disposal site!” a local newspaper enthused in 1976 about the Little Blue Run Impoundment, 1,000 acres of turquoise water that doubled as a receptacle for tons of arsenic-tainted coal ash. Decades later, the dumping continues, but there is no sign of the idyllic recreational lake promised by electric company executives. Some neighbors are moving out to escape spreading groundwater contamination, foul odors and clouds of chalky dust. Others would love to flee but can’t because their property values have plummeted. Today, the Intelligencer finally picked up the story. The article by Stephen Huba covers both sides and does explain some of what is going on between First Energy, who owns the site, and the West Virginia and Pennsylvania departments of environmental protection. What is missing from the coverage is a reaction from Representative McKinley who has become coal ash's biggest supporter (he won the Coal Ash Association Award last year) in congress while ignoring the plight of these constituents. Here's a short video about Little Blue Run from Vice News: "This Lake Shouldn’t Be Blue" (Excerpt from ‘Toxic Waste in the US: Coal Ash’).